While this picture is quite hilarious and cute, use of better background could probably benefit you more. It looks like a picture taken in a living room. Also it seems like you are using the flash instead of directional lighting, may want to work on that. This image reminds me of a piece of work that i had done including hot dogs. The picture seems cute and funny, but i think it has a deeper meaning, maybe asking us to consider what we eat and why we eat it. Also the bun looks as if it was purposefully beaten up. 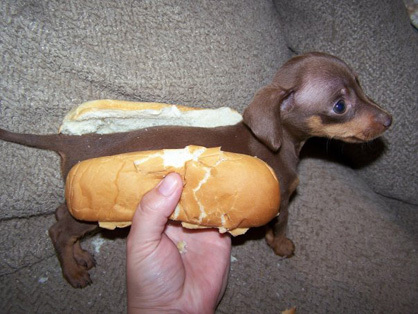 Who can’t resist a hot dog once in a while. I think this photograph is widely overdone and I’ve seen it a million times but I can’t get enough of it. I’ve gotta get me one of dogs! This doesn’t have the appeal of a professional photograph, however the humor and adorable feeling that comes with this photo is what holds it’s strength. many people would take a second look at this because of it’s personable appeal.